Giles Barker lost his life while caving in Spain in 1992. An accomplished cave photographer, Giles was a member of the Red Rose CPC and Morgannwg CC and Morgannwg secretary Judith Calford suggested inaugurating an award in his memory and since 1993 the two clubs have annually funded the Giles Barker Award. This prestigious award is given to a person connected with any aspect of cave photography in recognition of his or her excellence and contributions to the field. The award is normally presented at the annual Hidden Earth conference and is recognised as being of national importance. The trophy itself was for the first two years made our of cave-collected clay by Morgannwg member Karen Sinyard. Since then a a hand-crafted and therefore unique statue of a cave photographer has been made by artist Ceris Jones. The following list records past winners of the Giles Barker Award since its inception. Citations, as issued to the caving press, are written by Chris Howes on behalf of the two organising clubs. 1993 Jerry Wooldridge For continued overall excellence in cave photography together with an originality of approach in colour printing techniques which extend the boundaries of cave photography, the first recipient of the Giles Barker Award is Jerry Wooldridge. 1994 Peter Collings-Wells A relative newcomer to the photo salon, Peter Collings-Wells takes this year’s award for the overall quality of his colour prints and other work. 1995 Richard Rushton A promising newcomer to the photo salon, having entered a portfolio of small prints of a high standard, in receiving this award Richard Rushton will hopefully be encouraged to continue his underground photography and go on to even greater achievements. 1996 David Gibson For his support of cave photography, both in initiating the publication of Underground Photographer and development of a slave unit circuit which is now in widespread use by cavers, David Gibson is a very worthy recipient of the Giles Barker Award. 1997 Chris Howes For his excellence in cave photography over many years and, in particular, his continuing teaching and encouragement of newcomers to cave photography (including lectures, articles and books and the production of Images Below, a comprehensive manual on the subject), Chris Howes deservedly gains the fifth Giles Barker Award. 1998 Gavin Newman The 1998 award goes to Gavin Newman for his professional approach and overall excellence in cave photography and, in particular, his outstanding audio visual presentations, some of which have been specially constructed for BCRA conferences. His awesome ‘Caves of Thunder’ sequence is a notable example that will be remembered as a pioneering advance in the field of cave photography. 1999 Sid Perou For many years one name has stood out among caving cinematographers: Sid Perou. He has developed filming techniques and shown others the way forward; his influence in the field is widely acknowledged, and rightly so. Sid is presented with the 1999 Giles Barker Award for his continuing excellence and the entertainment that he has given to so many cavers for more than 30 years by creating films underground. 2000 Paul Deakin Paul Deakin is well known in cave photography circles and bibliophiles will recall his involvement in 1975 in the production of British Caves and Potholes, one of the earliest British caving coffee-table books. More recently he has created memorable audio-visual sequences, shown at local and national events, and is particularly known for his fine colour prints of mines and caves (including the modern classic of Titan shaft). Paul is therefore a worthy recipient of the 2000 Giles Barker Award for his continuing excellence in underground photography. 2001 Andy Eavis Andy Eavis is often first associated with his expedition expertise and leadership, and it is easy to forget that he is also a superb cave photographer; his pictures have graced many a magazine cover and expedition report. In addition, Andy has supported cave photography within his expedition ethos by including specialised photographers in the team rather than leaving the visual record to hit-and-miss. With his recent added venture into digital 3D AV sequences, he richly deserves the 2001 Giles Barker Award. 2002 Glenn Jones Audio-visual sequences have become a staple part of the Hidden Earth conference. Glenn Jones began constructing sequences in 1991 and by 1996 was showing his work to cavers, progressing through different versions of his Vercors AV at successive Hidden Earth conferences and creating three of its new-format opening sequences). During this period Glenn also produced DSS The Movie and moved from two projectors to four, then to six, and by popular request has shown his AVs at many other caving events around the country. He was the winner of the newly instigated AV competition at Hidden Earth in 2001 with Caving. Congratulations go to Glenn as the recipient of the tenth Giles Barker Award in recognition of his enthusiasm and dedication both in his photography and producing AVs. 2003 Andy Sparrow Giles Barker was often involved with teaching the sport to young people. It is particularly fitting, therefore, that the 2003 award goes to a film-maker who has produced three instructional caving videos (the Cave Safe series), as well as entertaining cavers worldwide with his productions of Solo, which has won several international awards, and the recent dramatised account of the discovery of the caves in Fairy Cave Quarry, A Rock and a Hard Place. Congratulations to Andy Sparrow for his well-deserved award. 2004 Peter Harvey With the 2004 presentation being made to Peter Harvey from South Wales, the award has widened its scope as Peter’s photographs date back to the 1950s and ’60s. Even considering the advances in cave photography since that time, his results stand up against more recent work. Peter’s negatives have been scanned to a high standard and he has produced modern prints using up-to-date computer technology, some of which were on display at Hidden Earth 2004. This is a deserving award, given Peter’s dedication at the time to taking the original image, and now to maximise its potential using today’s printing methods. 2005 Robbie Shone This year the award goes to an outstanding cave photographer who has embraced the latest in technological advances and shoots solely using a digital SLR camera. Always willing to learn, his dedication to producing the results he desires is extraordinary and over the past twelve months the outcome has wowed his viewers. His pictures have been printed in recent editions of Descent magazine and have drawn many admiring comments, including winning the delegate ballot at Hidden Earth 2005. Choosing the recipient for the 2005 award was a very easy task, so much did Robbie Shone’s work stand out with his subtle use of lighting. 2006 Maurice Hewins Maurice Hewins has for many years worked to document and preserve our heritage of caving films, both old and modern. In this, Maurice has collected data on the photographers and their productions, recording the techniques they used and the people who appeared in often obscure films. Most importantly, he has also – with permission – gathered copies which he has lodged with Wells Museum. His work, from which future generations will benefit greatly (let alone the enjoyment the current caving community has gained), makes Maurice a very fitting recipient of the 2006 Giles Barker Award. 2007 Ron Bliss The Giles Barker Award for cave photography was presented to Ron Bliss for his lifetime spent producing fine pictures underground, taking him through changes in technology and culminating in his preparing a slideshow showing the beauty of the Dales caves that he loved and pressing home a strong conservation message; there can be no stronger use of photography in this way. Unfortunately, this is the first time there has been a posthumous award as Ron died shortly before the first public showing of his work; the award was accepted on his behalf by a representative of Ron’s club, the Red Rose CPC. 2008 Paul ‘Footleg’ Fretwell In 2008 the award goes to Paul ‘Footleg’ Fretwell for the encouragement he has given to cave photographers over many years, through lectures and workshops on techniques to helping to run the Hidden Earth photo salon. In this he won the British Newcomer Award in 1999 and since then has produced an increasingly high quality of underground photographs and has begun working with inspirational audio-visual presentations. 2009 Clive Westlake For 2009, the Giles Barker Award was presented to a photographer whose published work has surely been seen by all cavers at some point, whether in a book or magazine or, commonly, as an original b&w print handed around at a club meeting. With his photographs shot on both sides of the UK’s and Europe’s sumps, Clive Westlake is thoroughly deserving of this prestigious award. 2010 Rob Eavis In 2010 the award, a hand-crafted statue of a cave photographer made by Ceris Jones and funded by Giles’ old clubs, was announced at Hidden Earth in September and goes to Rob Eavis. In this it recognises both the ongoing quality and high standard of his photography and, in particular, the imagination he has shown when experimenting with different light sources to produce a series of very original images. Congratulations to Rob for a well deserved award. 2011 Brendan Marris For 2011 the award, a hand-crafted statue of a cave photographer made by Ceris Jones, goes to Brendan Marris. Brendan has become known for a consistently high standard of underground photography and, since 2008, publishing regular updates on his website at www.ogof.org.uk. As part of a personal online project, he is documenting the caves of South Wales, logging the results against digital maps. Both the quality of his work and his comprehensive approach make Brendan a worthy winner. The 2012 award was announced at the Hidden Earth meeting in September and, after a gap of six years, the subject of underground films returns to the fore. Dave Webb has been involved with the medium for over twenty years, variously making films to a consistently high standard, helping to judge the Hidden Earth video salon (which he has also won), sharing his knowledge through teaching at workshops and always entertaining others with exceptional film shows. He is particularly recognised from his documentaries To Titan from the Top, concerning the discovery of Titan, and Fight for Life about the tragic loss of Neil Moss in Peak Cavern. Dave was recently appointed as the guardian of the 1960s film The Underground Journey, conserving it for future generations. Dave’s prolific output at such a high quality makes him an entirely appropriate recipient of this 20th Giles Barker Award. 2013 Pete Glanvill For 2013, the 21st Giles Barker Award was presented to Pete Glanvill at the Hidden Earth meeting in September. Pete has, for nearly three decades, produced fine documentary and artistic images of the underground depicting both caves in the UK and while on expedition overseas, creating presentations and supporting his own and others’ articles in print with photographs of the latest breakthroughs, most recently on Mendip in Reservoir Hole. More than that and very much in the spirit of the award, he has encouraged others in their photography and on many occasions worked in the background judging the Hidden Earth Photo Salon. For his long-term commitment to cave photography and indefatigable nature, Pete deserves our congratulations for his award. 2014 Martyn Farr The award for 2014 was given to Martyn Farr who, as well as being known as an enthusiastic digger and cave diver, for decades has photographed his discoveries, both above and below water. Indeed, he was an early experimenter in sump photography and has since built up an impressive portfolio of images from the UK and around the world. The excellent quality he has attained, most recently with his dedication to detail in solo photography beyond remote sumps and using a GoPro video camera in incredibly demanding conditions (examples may be viewed at: www.vimeo.com/farrworld), makes Martyn an extremely suitable winner of this 22nd Giles Barker Award and we congratulate him for maintaining his high standards. 2015 Paul Dold For 2015 the award went to Paul Dold. Paul has shown the depth of his commitment to cave photography by the degree of planning and effort that has gone into the production of some of his fine photographs, sometimes returning to the same spot several times to improve on past efforts in order to achieve his vision. A past winner of several categories in the Hidden Earth Photo Salon, Paul has been exceedingly generous with his time spent encouraging other photographers, not least through helping to run the salon over the past five years and offering constructive critiques to entrants. Our congratulations go to Paul, who is an eminently suitable winner of this 23rd Giles Barker Award. The award for 2016 was presented during the EuroSpeleo congress in August to acknowledge the fine video work produced by Andy and Antonia Freem. Their commitment has gone beyond merely filming in difficult situations and has extended to helping others learn the craft, sharing their knowledge and recording ‘live’ exploration such as at Ogof Marros in West Wales. Most recently, the pair organised the video salon at EuroSpeleo, to the benefit of the wider caving community. Congratulations go to Andy and Antonia for their very deserving award, the 24th in the series. For 2017 the award went to a prolific and accomplished cave photographer who, over recent years, has produced an increasing standard of imagery and built up a superb body of work. He has gained the Premier Trophy at Hidden Earth twice, as well as winning numerous other categories, and there can be few cavers who have not seen at least one of his images in use, from Descent covers to illustrations in caving books and even to the beer mugs at this year’s Hidden Earth. Congratulations therefore go to Mark Burkey for gaining this recognition, which is so well deserved. 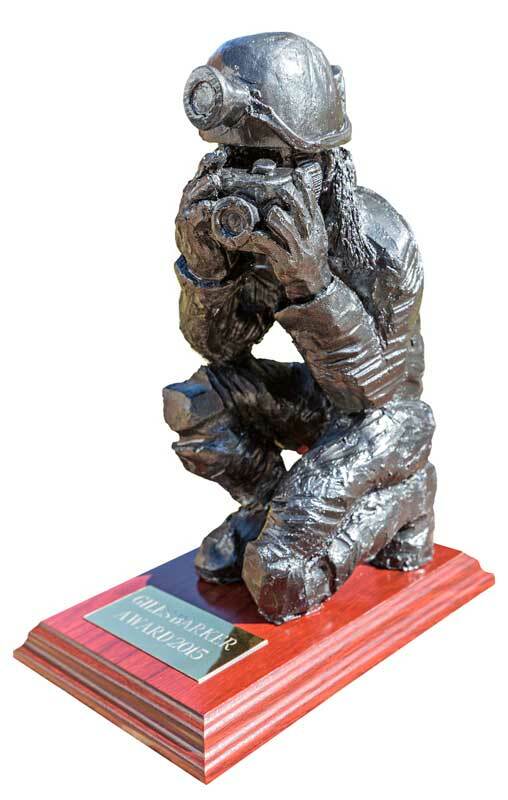 This 25th award was made in October at Hidden Earth, this being a hand-crafted figurine of a cave photographer created by Ceris Jones. 1. The Giles Barker Award is presented to a cave photographer (or a person associated with cave photography) annually, in recognition of excellence in any aspect of cave photography. 2. The winner of this prestigious award will normally be announced at the annual Hidden Earth conference or, if this is not held, it will be announced in the caving press. 3. The winner is selected by representatives of MCC or RRCPC. If appropriate, input from the Photo Salon judges may be requested. 4. The prize will be a trophy which is retained by the winner, funded by MCC and RRCPC.